I'm a sucker for gorgeous garden roses and a beautifully constructed bouquet, but that ivory rose wrap is just an irresistible detail I couldn't pass up! 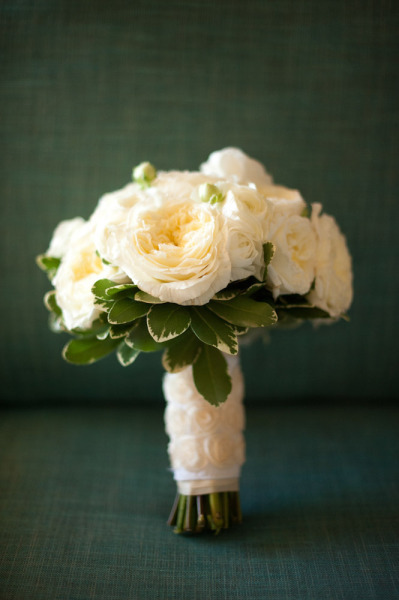 Image by Liga Photography, Bouquet by Botanica International Design Studio. These are gorgeous. I need some flowers in my life. Garden roses are so special & yes, so is that bouquet wrap! So pretty!! I haven't had fresh flowers in so long! Amazing. The extra bit of texture really adds something special! So beautiful. I love the greenery too!